Polls and forecasts for Super Tuesday. 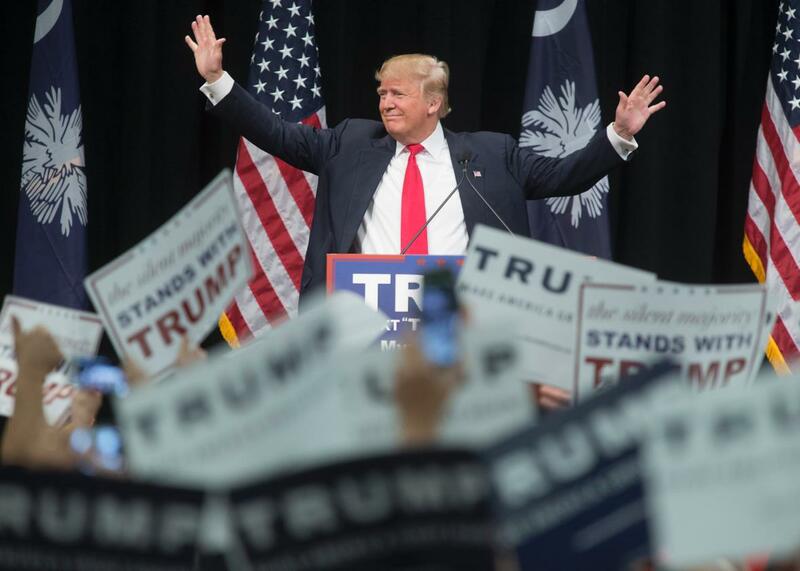 Donald Trump speaks at a rally February 19, 2016 in Myrtle Beach, South Carolina. We’re less than a week away from Super Tuesday, when roughly a quarter of the Republican delegates will be up for grabs. Reliable polling is still remarkably hard to come by for many of the 11 states voting on Tuesday, but by now it should come as no surprise which Republican is the favorite to have the best day: Donald J. Trump. Polling has been so sparse that Nate Silver and his team at FiveThirtyEight have only released forecasts for roughly half of the contests, but Trump appears to be a good bet to add to his win total in Alabama, Georgia, Virginia, Massachusetts, and Vermont, where he enjoys comfortable double-digit leads and where he’s already posted commanding victories in nearby states. He’s also the favorite in Oklahoma, where his advantage is smaller though still clear, and looks to be competitive in Alaska, Tennessee, and Minnesota, as well. The only place where the GOP front-runner appears particularly vulnerable is Texas, which will divvy up the most delegates that day. Losing to Cruz on his home turf won’t derail the Trump train—especially since he could still snag a decent chunk of the state’s 155 delegates—though it would be a welcome development for Cruz, who would lord it over Marco Rubio and John Kasich, both of whom are trailing Trump in polls of their own respective home states. Rubio is desperate for a win anywhere he can get it, but it’s unclear where that might happen next Tuesday. (Minnesota?) Kasich, meanwhile, is just trying to survive until the race reaches the Midwest in the middle of the month. There will be a total of 595 delegates up for grabs Tuesday, nearly half of the 1,237 needed to secure the Republican nomination. None of the contests, though, are winner-take-all affairs—those don’t start until March 15—which means Trump may emerge with a commanding lead, but it won’t be an insurmountable one. Here’s a quick look at where things stand in Super Tuesday’s 11 nominating contests.